Mt Meru is a real gem of a mountain and is often ignored by trekkers who only seem intent on climbing Kili. Meru is the second highest mountain in Tanzania at 4,565 m. There are great views down to the subsidiary cinder cone on the crater floor and of course across to Kilimanjaro for the next climb. Combining trekking to the summits of the Africa’s continent’s highest and fifth highest peaks. Starting with the beautiful ascent of Mt. 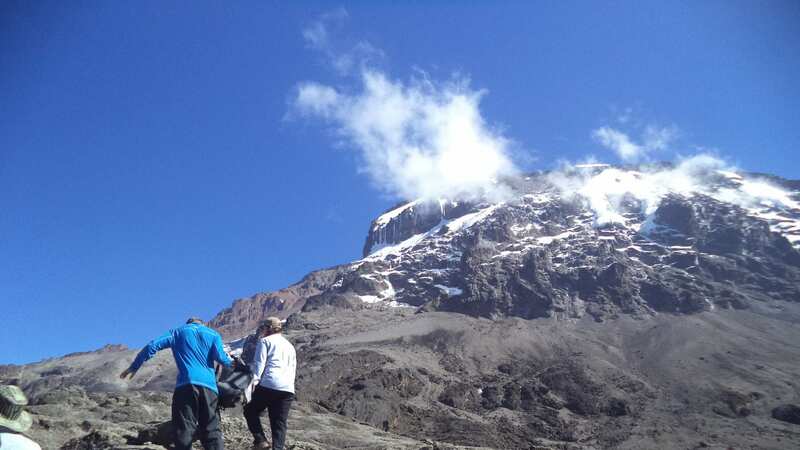 Meru – an exceptional crater rimroller – coaster warm up and acclimatization trek for the big one – Mount Kilimanjaro Lemosho route. . The route approaches Mount Kilimanjaro from the west, beginning with a long drive from Moshi to Londorossi Gate. From there, the first two days are spent trekking through the rainforest to Shira Ridge. Unlike the popular Machame route, which simply intersects the Shira Plateau, the Lemosho route crosses the entirety of the plain from west to east in a pleasant, relatively flat hike. An added bonus is that climbers will encounter low traffic until the route joins the Machame route. Afterwards, Lemosho follows the same route through Lava Tower, Barranco and Barafu, known as the southern circuit. Descent is made via the Mweka route. Arrive at Kilimanjaro Airport (IATA code: JRO). Eco-Africa Climbing representative will be there to collect and transfer you to your hotel in Moshi. That night or early the next morning you will meet the rest of the group and the Eco-Africa Climbing crew. Your Eco-Africa Climbing guide will provide a full pre-trek briefing. Day 2: Moshi – Arusha National Park-Momella Gate. After an early morning breakfast, you will be picked up from your hotel and brought to the Momella Gate in Arusha National Park. At this time, the porters will organize and pack the belongings for the hike while you and your guide register with the Tanzania National Park (TANAPA). You will then begin your ascent in Arusha National Park. The first day of hiking is similar to a walking safari; you should expect to see giraffes, zebras, antelope, buffalo, and potentially elephants near the trail. Due to the high possibility of spotting wildlife, an armed ranger, hired through the National Park, is required to hike with our team for the duration of the hike. As you continue hiking, you will pass the Ngarenanyuki River and a beautiful waterfall at the base of Mt. Meru. Upon arriving to Miriakamba Hut (2500m), your chef will prepare a hot dinner and washing water for you. Enjoy the beautiful sunset and overnight. Elevation(m): (1,387 m to (1,500 m) | Distance: 10 km | Hiking Time: 5-7 hours | Habitat: Montane Forest. After breakfast, you will start ascending up the steep trail along the ridge of the saddle. You may see various wildlife along the way! The trail has views of Mt. Meru Crater and the Ash Tray. When you arrive at camp, you have the option of hiking Little Mt. Meru (3820m) with your guide to further acclimate. You will be served an early dinner, so you can receive ample rest before your midnight summit attempt. Get to sleep by 1900. Elevation (m): 2,514 m to 3,570 m | Distance: 8 km | Hiking Time: 3-5 hours | Habitat: Forest and Moorland. Elevation (m): 3,570 m to 4,565m to 2,514m | Distance: 5 km up 13 km down | Hiking Time: 10 – 12 hours | Habitat: Alpine Desert Moorland and Montane forest. After a long rest and breakfast, we will begin our final descent to Momella gate. We will hike through forest and meadows where it is likely to spot wildlife. At the base of Mt. Meru, you will be greeted by our driver who will take you back to the Hotel. Spend a relaxing day by the pool or have a stroll around. A walk to this small town of Moshi with view of the mountain is as good as it reveals. Dinner and overnight at hotel. Mkubwa (Big Tree) campsite (2800 m). Trekking Time: 2-3 hours ⎟ Distance: 5 km⎟ Altitude Gain: 411 m.
glacier) at 3500 m and then gently downwards to Shira Hut 1 located near a stream on the Shira Plateau. Trekking Time: 3 hours ⎟ Distance: 8 km ⎟ Altitude Gain: 719 m.
Karanga Valley (4000 m) for overnight. Barafu Camp (4600 m) where you have the entire afternoon to rest before ascending towards the summit. upwards to the summit glaciers. You will be climbing scree for 5 to 6 hours but you gain incredible height over a short distance. The views are spectacular. You should be on the crater rim at Stella Point (5750 m) as the first rays of the sun emerge. Spectacular ice cliffs within the crater surround you and the views to Mawenzi peak and beyond are breathtaking. Another hour’s walk takes you to your goal, the summit of Uhuru (5896 m), the highest point; Uhuru means freedom in Swahili. yourself to a well-earned shower and a cold beer or two. We can wake up early for a sunrise game drive in the Serengeti at Dawn if you wish. This should be discussed with your safari guide on the previous night. After the early morning game drive you will take breakfast at the lodge/camp then leave with a packed lunch and spend the whole day in the endless plains of the Serengeti National Park. Serengeti National Park is the largest part of the Serengeti – Masai Mara Ecosystem that stretches into Kenya and is the stage for the Annual Wildebeests Migration that sees Millions of Wildebeests, Zebras and Gazelles trek thousands of Kilometers in search of pasture and Water. Serengeti is also the home for some amazing numbers of wild animals and bird life. Overnight at Serengeti Kati Kati Tented Camp. All meals are included. Breakfast, Lunch/lunch box and dinner. Early morning game drive can be done and after breakfast you will check out and drive back to Moshi, Arusha or to the Seronera Airstrip for your flight Back to Arusha town where the Serengeti Safari ends. This safari can be done in 4 or 5 Days depending on your Preference and availability of time. This Serengeti tour can be done while staying at luxury, or Mid-range or budget safari lodges/ tented Camps, or as a Camping safari The Serengeti Safari can only be done as a private safari and we can include your arrival airport pickup and Accommodation at Moshi or Arusha. This Safari can start from Moshi, Arusha, Zanzibar, Dar es Salaam or even from Mwanza Tanzania. 4 nights in a hotel in Moshi on a Bed & Breakfast basis and Double Occupancy ( before trekking & after trekking). Kilimanjaro National Park rescue fees (Kilimanjaro Rescue Team) and Arusha National Park rescue fees. Salaries for mountain support crew, as per required KINAPA and KPAP. Kilimanjaro National Park and Arusha National Park certificate for your successful summit attempt. Compulsory tips for guides, porters, cook, safari guide & lodge /camp staff. Health requirements (Yellow Fever – only compulsory if you travel to Tanzania via a Yellow Fever infected country, Meningitis & Hepatitis A remains optional, but comes recommended). Accommodation at Moshi or Arusha after the safari. Laundry services during the safari. Alcoholic and non alcoholic drinks & beverages. Single supplement, for single tent/room, per trip $800. Extra hotel night in Moshi, check in 11AM, check out 10AM, per double room $180. Materuni Waterfall (1 day trip), cost $50 per person. Marangu Coffee Tour (1 day trip), cost $75 per person.